For nearly fifty years, she was the common-law wife of Wyatt Earp: hero of the O.K. Corral and the most famous lawman of the Old West. Yet Josephine Sarah Marcus Earp has nearly been erased from Western lore. In this fascinating biography, Ann Kirschner, author of the acclaimed Sala's Gift, brings Josephine out of the shadows of history to tell her tale: a spirited and colorful tale of ambition, adventure, self-invention, and devotion. Reflective of America itself, her story brings us from the postвЂ“Civil War years to World War II, and from New York to the Arizona Territory to old Hollywood. In Lady at the O.K. 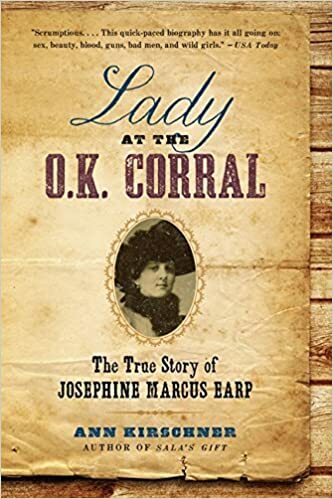 Corral, youвЂ™ll learn how this aspiring actress and dancerвЂ”a flamboyant, curvaceous Jewish girl with a persistent New York accentвЂ”landed in Tombstone, Arizona, and sustained a lifelong partnership with Wyatt Earp, a man of uncommon charisma and complex heroism.